Let me begin by saying I'm new to this forum. 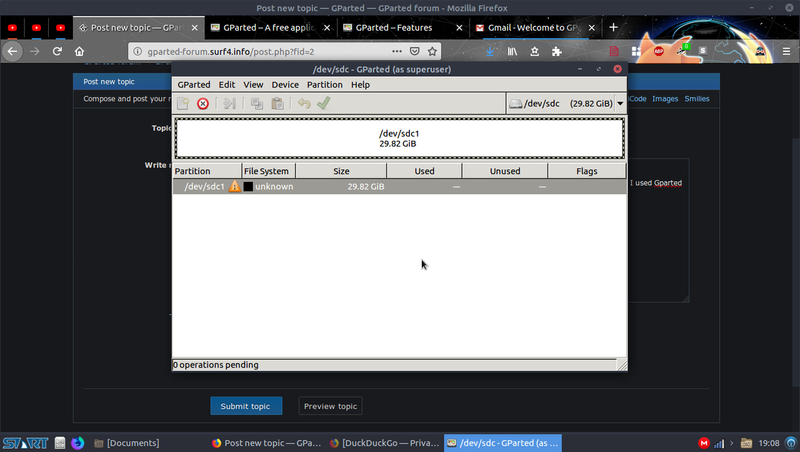 I created a bootable USB with Ubuntu on it, couldn't natively delete file (so I can reuse the USB for other purposes) so I used Gparted to format it. I formatted it (see image) I cannot format it with a file system (e.g ntfs (which I prefer), ext3, reiserfs, etc). I'm quite stuck here which is why I need help. Thank you for including the screen shot and GParted details. That helps a lot. So every time you attempted to format partition sdc1 with a file system it failed at the "set partition type" step. What is odd though is that there is no libparted message reported with that error. here is the data, in order as requested. You have a BSD partition table on that USB key. Very unusual. Write a new partition table to the USB key (Device > Create Partition Table) and take the default of MSDOS. Then you will be able to create a new partition containing an NTFS file system.